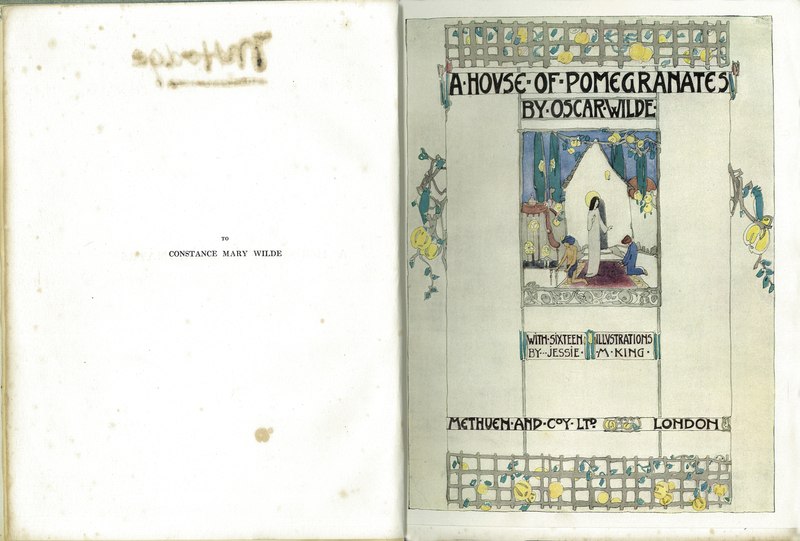 A House of Pomegranates (1891) is Wilde’s second published collection of short stories, following The Happy Prince and Other Tales (1888). Wilde dedicated A House of Pomegranates to his wife Constance (1859-1898), a gesture interpreted by some as an implicit apology for his shortcomings as a husband and father to his two sons. Wilde purportedly said that this work was ‘intended neither for the British child nor the British public’, referring perhaps to the dark nature of the tales and their political allegories. Oscar Wilde, “A House of Pomegranates,” ourheritage.ac.nz | OUR Heritage, accessed April 26, 2019, http://ourheritage.ac.nz/items/show/10227.